Jurgen Klopp is often a very matter of fact person. In fact, the only time he’s especially riled up is during or just after Liverpool matches! Today during his press-conference, the German was asked his opinion on spy-gate – which has been the talk of English football this week. Leeds boss Marcelo Bielsa admitted to sending a coach to spy on Derby’s training sessions before their Championship clash – and then gave a two-hour presentation to astounded journalists on Frank Lampard’s tactics and his players’ strengths – indicating that in-depth analysis on every opponent is utterly standard practice. It’s led to debates on the morals of the behaviour and Klopp was happy to explain his opinion at Melwood. The German said that the two days before a game should be sacrosanct and only available to the team – criticising Bielsa for attempting to gain this advantage. 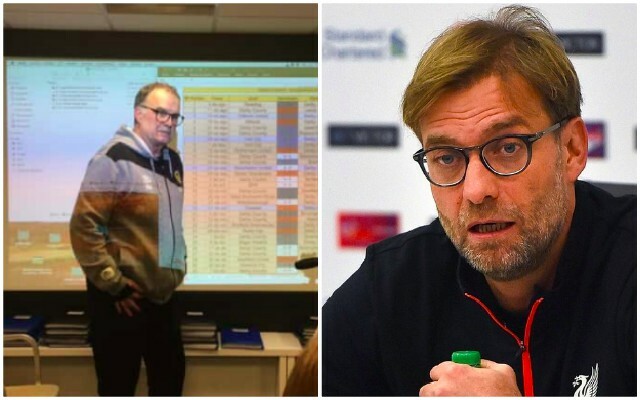 “What do you think was the reason for the curtains (around the pitch at Melwood)?” Klopp began. “We use the curtain when we train the set-pieces and with the players who are available for the weekend. “Minus 2 and minus one days (before a match) the curtains are in place as these are important sessions. “I can understand Bielsa wants to have all the information but we have to accept we don’t get that. “We have to respect the last 2 sessions before a game. Only a few people should see that – I think we all agree on that. “He is an outstanding coach and role model for so many: when I came I didn’t see 51 games of Derby. We suppose this sounds fair enough, to be honest. At first, we found Bielsa’s spying and subsequent presentation quite funny – but can also understand how a manager would feel disrespected by a coach of an opponent bringing pliers to the training ground to see through a fence – as Leeds did!